Two years ago I participated in the inaugural Loudon Half & 8K. It is a race put on by a local running store in conjunction with an area running club. Its proceeds benefit local high school running programs. Plus, it's at a time of year when the cherry blossoms are still out, making for a really scenic run. 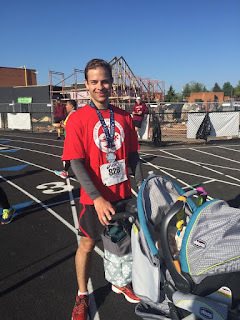 At the time, I had had varying levels of success dating back to my first half marathon in 2007. I had never broken the two-hour barrier and so I set a conservative goal (based on my training at the time) to simply break two hours. I smashed that pretty handily at 1:48:12. I'm not quite sure what I was expecting being the primary caregiver for my daughter. I had some fear that it would be more than I could handle, but that turned out to be unfounded. Things went exceedingly well. Being the data-collector that I am, I created a log of my daughter's activities (e.g., when she napped, when she ate, how much she ate, etc.) on the first day, and by the second day, I was able to easily predict when it was time to go down for a nap before she was overly tired. I was able to predict how much milk to defrost before she got so hungry that she threw a fit. In short, I could not have imagined it going better. I'm pretty spoiled by my job at a Federal consulting firm. It's really easy to take for granted the lenient policies they have in almost all aspects of employee benefits. As an example, I have to remind my team (and myself) that you don't actually "request" time off - you simply let your supervisor know that you are taking it. It's not a request because it can't be denied. So it's no surprise that the Parental Leave policy here is pretty great as well. Well, it's mostly great. I had to do some finagling to actually work it since I'm a dad. It's funny - the policy was clearly made in such a way as to not discriminate against men, but also in such a way as to ensure that men do not get to be the primary beneficiaries of the policy.